In this reminder, we wanted to give you a heads up to about the early registration in AEEDC 2019 to take advantage of the discount ( up to 420 AED ) if you register before the 1st of October 2018! UAE International Dental Conference & Arab Dental Exhibition or AEEDC, is a yearly Dubai event and the largest dental event in the Middle East, North Africa, and South Asia region. Improving your dental knowledge and learning new ideas. Get the credit hours (CME / CE ) needed to renew your dental license. A chance to socialize with people working in the same field and meet old friends. One of the largest dental exhibition that sells severely discounted equipment and materials. It’s important to haggle on the last day! Date: AEEDC occurs every year on the first Tuesday of February and lasts for three days ending on Thursday. In 2019, AEEDC will be on the 5th till the 7th of February 2019. 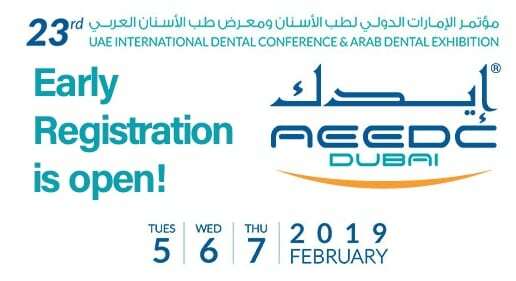 * OziDent.com has no affiliation with ADEEC 2019, we are informing you as a reminder of the Early Registration.